Hungry? Missed breakfast and snacked on some useless junk at lunch? Now you are scavenging your kitchen looking for something good to eat that does not take hours to make? I know the situation you are in. It happens to me on those days when I am home alone and Soeren is away. See, with Soeren I have more or less routined meals - at proper hours, healthy and tasty. However, when he is away for the weekend I quickly fall into that lifestyle where there are no responsibilities in that department. Then I can spend hours taking photos or blogging and when I look at the time, I realize "OMG! How fast the time flew!" and it already dinner time. That fact is also determined by the vicious growling in my tummy that reminds my to get some food in there fast. If all this sound familiar then I have the perfect answer for you. This pasta dish! It is simple, wholesome and boy does it taste good. So good that the simplicity should not be taken for granted because I would even serve this to my guests. I am pretty confident that this would go down well for an elegant dinner party and it only takes approx. 25 minutes to prepare. Rachel Ray would be proud of me!! The flavors here harmonize so well together that it becomes a very lavish dish, tastewise. The zucchini is probably the most popular of the summer squashes, members of the Cucurbitaceae family. It contains a large amount of vitamins A and C. They also contain high levels of potassium and calcium. You can buy zucchinis in green or a lovely yellow color. Although culinarily, zucchini is considered to be a vegetable, biologically, the zucchini is a fruit. It is he swollen ovary of the zucchini flower. It is considered to be one of the easiest vegetables to cultivate in a temperate climate. The zucchini flower can be male or female. The female flower has a golden blossom on the end of the zucchini and the male flower grows on the actual stem of the zucchini plant and is slightly smaller than the female. Both flowers are edible and can be prepared in several varieties. The skin of the zucchini should be fresh, glossy, tender and free from blemishes. Over ripe zucchini tends to be a bit stringy and bland in taste. The smaller ones are the tastiest so look out for those that are 8 to 10 inches long. Zucchini is best eaten soon after purchase. You can store it in the fridge for 3 to five days. Another way to store a large amount of zucchini is to dice them and place in plastic bags, seal well and freeze. You can always take a handful out for salads, soups and quick pasta dishes. More interesting information and recipe for sage. As so many of you, who left the wonderful comments, would come over without any hesitations, I invite you all to join me at my Monthly Mingle and help me finish the food that will line the tables. Every single entry looks so good. If you are curious check back on the weekend for the round-up. Album: Back to Bedlam - I recommend this! Boil a large pot of salt water and prepare your spaghetti. If you are using fresh pasta this should take a couple of minutes. If you are not, then this should take approx 8-10 minutes. In the meantime, heat some of the oil in a large pan. Saute the onions and garlic gently until slightly caramelized. Add the diced zucchini and saute for a further few minutes. Salt and pepper to taste. Using some of the sage leaves finely chop them and add to the zucchini. Pour the lemon juice and add the chopped zest. Remove from heat. Mix the spaghetti with the lemon zucchini mixture well. Place on individual plates. 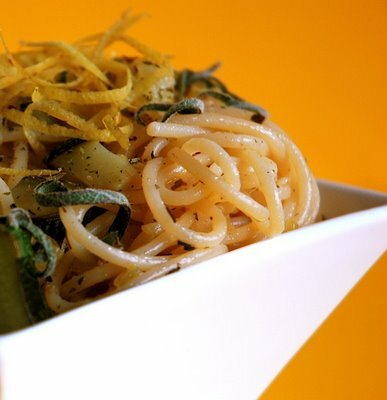 Pour a few drops of the remaining olive oil and sprinkle the remaining lemon zest and sage over the top. Serve with grated Parmesan. Perfect for the big hunger! Looking at the dish one cannot imagine all the flavors this little creation contains. 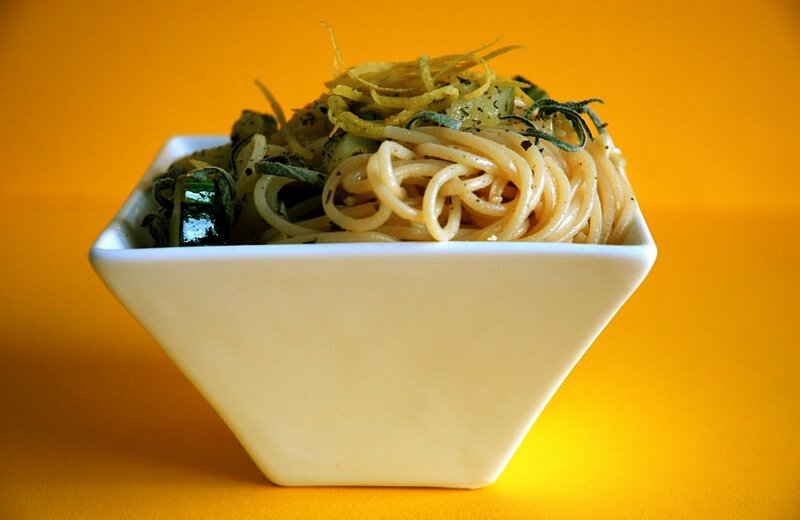 But one bite and the tangy lemon, sweet sage and the soft zucchini bring wonderful smiles to all sitting at the table. Tom at first was skeptical because it looks a little plain on the plate. However, after he tasted, he was amazed how well all the aromas combined with each other. Next time if you are being attacked by that big hungry tummy growl - attack back with a big bowl of this pasta. Enjoy! I'm coming over on the next plane! Do you even really need to ask?? meeta i'd come over for lunch regardless of what you serve! i can rest assured it'll be lipsmackingly fingerlickin yummy and look great too! and i forgot to add - great company! yes, i am about to be at your place, brought some cassis to make a kir to drink as an aperitif. Most definitely. I think I would eat anything you served. AWWW! You're all just fantastically wonderful. When I posed that question this morning I never really realized I would get that much of feedback and some touching comments. It feels so good to be bathing in your warm friendship ladies! I hope you like the recipe now! will definately gve it a try! I am already there with my pancakes, Lady!! What more do ya want?!!! OOPSIE DAISY!! There it is, a handful!! :)) I am happy now,okay!! oooh yummmm, i love your blog. such beautiful food, yay! I missed the Monthly Mingle! I don't know where my head has been these days. But I love this spaghetti and I have to try it with the very last of the zucchini ... a big kiss!